An interesting aspect of cultural behaviour is how people go about getting to know each other. What I mean is, when people meet for the first time do they exchange names straight away, or do they wait to see how things develop? And how long do people wait until they feel it is appropriate to introduce themselves? I would like to write about a recent experience that demonstrates beautifully how differently Americans and Germans deal with these questions. My husband and I went on a 3 week trip through South America where we toured five countries. We decided to book a guided tour so that we could see as much as possible in the short amount of time we had available. The tour was offered in Germany so our co-travellers were naturally German. I was the only American in the group. As an American, it is difficult to imagine spending 19 days with a small group of people (15) without knowing their names. Having lived in Germany for 30 years I wouldn’t have minded if last or first names. Travelling is such an exciting experience because it throws you into new situations that make you marvel or reflect. And people who share such experiences would naturally want to exchange thoughts and conversation, at least from my personal standpoint. So, the idea of having conversations over 19 days without knowing anyone’s names seems a bit strange, to me. Germans feel differently about this. It isn’t difficult to interact during this period without knowing each other’s names. My husband ensured me that most don’t even think about it, nor do they feel uncomfortable. The tour guide who picked us up never initiated a “getting to know each other” activity, so we were left to our own devices. During the first couple of days I decided first to observe how our co-travellers would deal with getting to know each other. As expected, no one felt uncomfortable about not exchanging names. If Germans introduce themselves, they would normally exchange last names and address each other as Mr and Mrs, or Herr and Frau. On the third day, I decided to do an American thing by saying: my name is Sabrina and this is Klaus. This nice couple smiled broadly and reciprocated. Keep in mind that I would never just walk up and say this in the minute of the first day because for Germans that can seem quite pushy. You have to give people time and you have try and feel whether it may be possible to initiate first names. The thing is, if I wait too long then it would also be a bit strange. The timing seemed right. By the end of the first week I had managed to get 11 members of the group to exchange names. I wasn’t so sure about the other 4 because my feeling told me they may not want this. Both couples were older and more reserved, so out of respect I held back. Then I was interested to see if these people would initiate name exchanging on their own, but they never did. These 4 people were comfortable not addressing anyone by name, even though they engaged in most conversations which they seemed to enjoy thoroughly! What is behind this difference? Germans tend to value an exclusive communication style whilst the Americans an inclusive style (House, 2005). Exclusiveness refers to the way we communicate with strangers or people we don’t know too well (out-group) and inclusive is how we interact with those we call our family and friends (in-group). An American who learns to speak German is confronted straight away with the use of formal and informal pronouns, Sie and du (formal and informal you respectively). 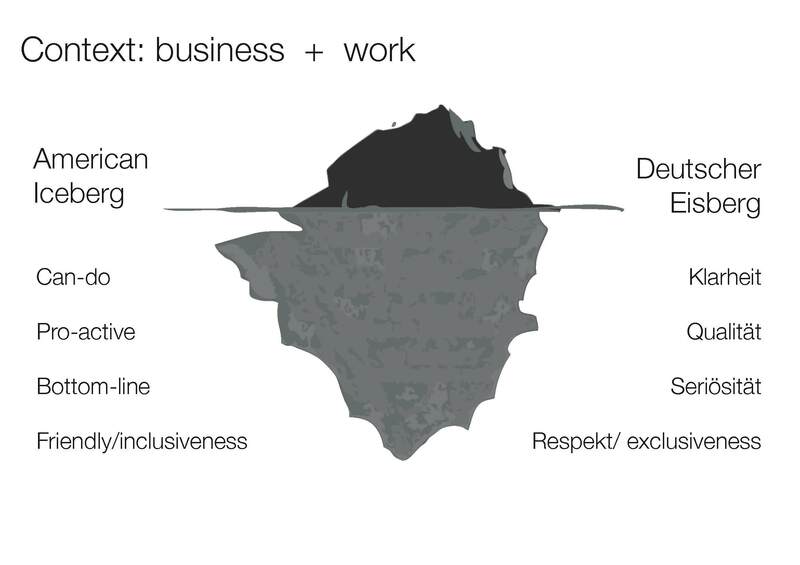 In other words, Germans learn to respect and value social distance. So, you should use Sie when you normally address a person with last name; and you use du with those you address with first names. By the way, German is not the only language with formal and informal pronouns; we only need to think of Spanish (usted/tu), French (vous/tu) and Italian (lei/tu). In America, inclusiveness is highly valued so that communication with people from one’s out-group tends to resemble in-group style. This is a person-oriented communication style meant to put others at ease and help make them feel as if they are a part of one’s in-group. It is interesting how quickly the word “friend” is used to describe another person one has just met – something quite foreign to Germans, who use it sparingly by comparison. To become a friend one needs a long history (whereby long is relative) with someone who shares many similar affinities. One has many acquaintances, people one knows by name and spends freetime with. An acquaintance can be addressed with first and last names – it depends on the relationship. Factors such as age and frequency of contact are important in determining whether a person goes from Sie to du. As soon as two people switch from Sie to du, there is practically no return without causing a terrible loss of face. Therefore, Germans like to take time to see if a relationship can develop into deeper level before making this step. Is all of this confusing? Yes, it is. If you are American you are probably asking: when does one get elevated from the acquaintance to friend category? After all these years, I’m still asking this question! History is usually an important criteria as well as feeling of similarity. However, I have known some people for over 25 years, who I would call a friend but, who would probably not refer to me as a friend. I have also known people equally long, if not longer who I still address formally. According to most Germans, the use of Herr or Frau and Sie is a token of respect. One doesn’t want to impose themselves on another person by offering their first name too quickly (again quick is relative). According to Germans I have interviewed, it is considered to be a privilege to use someone’s first name. And if you think becoming friends is complicated, knowing when to offer your first name is also not so simple. If a person becomes too familiar too quickly, I have heard Germans say: Have you and I ever been drunk together? This is a signal that means: I’m not happy about you addressing me by my first name. For most Americans this is all a bit too stiff and unnecessary. But we should keep in mind that the US has a history of immigration and pioneering that calls for a pragmatic approach to relationships. If American pioneers exercised an exclusive relationship style, they may have had difficulties meeting the challenges of living in a hostile environment. We all know the “in the same boat” predicament where people have to forget social differences in order to survive. From this perspective, friendliness takes on a whole new dimension. To end this, I would like to point out that no culture stands still. It is interesting to observe that German society is less strict about the use of first names and formal communication. It still has its place in German relationships, but the boundaries are becoming fuzzier. Young people are much quicker to go from Sie to du in work situations, something that was rare about 10 years ago. The older generation, 40+ was raised in a different period which is why they tend to follow the norms of exclusiveness more strictly. Of the 15 people on our trip through South American, all except three were 50+. Therefore, the need to exchange names was not as important for this group because these people lived their whole lives respecting other peoples’ space. This is not to say they don’t enjoy meeting and interacting with people outside their in-group, they just do it very differently. One last point, even if cultures don’t stand still, this doesn’t mean the younger generation is moving toward the American way of thinking. Most young Germans still value the principle of in- and out-groups. This means that they too need time to meet others and become “friendly”, and more often than not, they think like their parents: you can only have a few “friends”.